In late September I was working around in the vegetable patch, and wondering if my squash plants would mature fruit before the frost, when I was struck by the amazingly loud hum of insects nearby. A number of years ago I had planted rapini and probably mustard greens of some kind. Lots of it went to seed and every year thousands of the plants sprout up in the Spring. If they are not in the way I just let them do their thing, and their thing means blooming and going to seed and starting more plants. So they have become an established resident of the vegetable patch, and I get to eat the greens from May to October, without even having to sow a seed. They are delicious, and their bright yellow blooms add a cheerful note all season long. 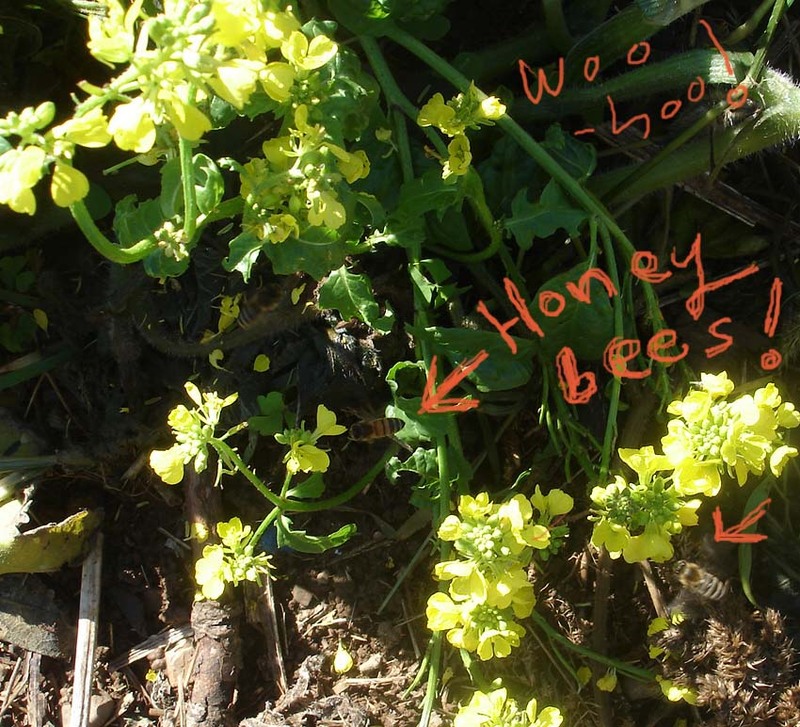 I have now discovered that these brassica family plants produce lots of nectar, and letting them flower and go to seed is a boon to the native pollinators, and honeybees. Like everyone else, I’ve been hearing about the demise of the bees, and I’ve done some reading into the problems with modern beekeeping, not to mention pesticide use. I’ve been thinking of bees for some time, with the idea to have honey bees here on the farm in future. Well, the bees are already here! This photo is not great, I don’t have a macro lens. These were the little creatures making the buzz in the rapeseed. There are not a lot of houses in the area, and no bee keepers within honey bee range, so I assume these are honey bees from a wild hive. They may have swarmed from some distant hive, perhaps more than once. Apparently there is a significant population of feral honey bees now thriving in the wilds of Nova Scotia. So next year I will be planting rapeseed on purpose, and sowing it in scattered patches far and wide on the property and in wild meadows. The reason I think this plant is so special for the bees, apart from the fact it produces a lot of nectar, is that it blooms and re-seeds, so there are blooms available from June to October. I plan to sow the seeds every few weeks to keep a good number of blooms going. The only reason I noticed the honey bees was that in October there are very few things blooming here. These bright yellow flowers were one of the only blooming plants available. So on every bright day when the sun warmed things up enough to encourage the bees to get out, they came right to this and one other late patch of rapeseed. And not only bees showed up! There were other wild pollinators thriving and making the most of the last nectar. I took the time to do a little research, and was able to identify four species of bumblebee, drone flies (they look like bees but are actually flies), mason bees, yellow jacket hornets, and several types of wasp… all highly beneficial insects essential to pollination. I was surprised to learn that many of these native pollinators are even more effective than honey bees in the pollination game. By planting lots of flowers, by letting things go to seed and letting patches of the garden go wild, we will help these beneficial insects do their job. Later I will post on specific plants to grow for the benefit of bees, butterflies, hummingbirds, and all the other pollinators. 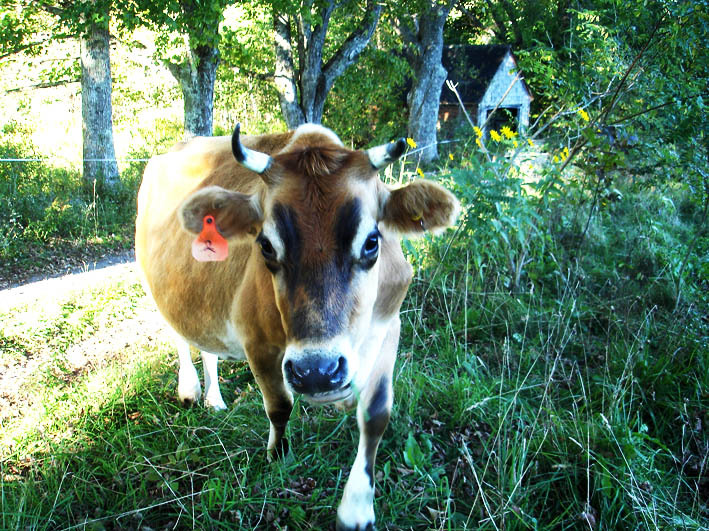 A dream come true for me, the beautiful Jersey cow Molly came here in October, and has more or less taken over. The milk is rich and delicious, and, unlike milk from the grocery store, seems easy to digest, especially in it’s most natural state–fresh from the cow.